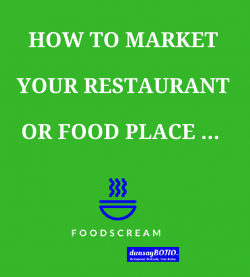 How to market your restaurant with restaurant advertising ideas that are easy and effective. Here are some tips on how you can market your restaurant or food service business in Singapore and Malaysia. Make sure you maintain your basics. Good Food, Acceptably Clean, Awesome Service will bring customers back to your food place. While these are the basics of maintaining your food business, offering more is possible. Here are top 10 tips that you can do to increase your food place visibilities and create the voice for your place! Let’s do it! Make sure you can be found on Google. Go to free listing at Google My Business and submit your food service business listing. Yes, attract new customers with your business listing on google. Get customers reviews to increase visibility and word of mouth advertisement. Foodie Pictures are under-rated. Snap appealing pictures of your food place, mouth watering pictures of your food and beverages. Post them online or offline to show them off! Oh, yes, this is exactly the time, when you have them, you definitely need to flaunt them, baby! Create your website, you can create free site on your own or outsource them for digital company to do it for you. Create your social media presence too. Be where your customers are. Be in facebook, instagram and twitter. Submit your url to food listing companies in your country so that you can be easily found when customers search for food that you serve. 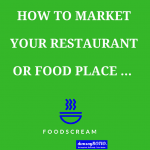 Give out brochures and flyers of your food promotion or launches to people around your area. Reach out to companies and other establishments nearby. Run online marketing promotion on your website and social media. Let your customers know that you are there, let them know what you serve, your promotion, your signature dish! Be visible! Create appealing videos of your food and beverage, customer testimonials, your signature dishes. Videos increase engagement, attention and conversion when done right. Use these videos as your main marketing tool and post them for your online or even offline marketing media. Run special promotions or adhoc promotions to increase your customers retention and attract new customers to your food place. Invite food bloggers to blog and share your food place with their audience or use the material to run more online marketing to reach more customers. The many advertising ideas for your restaurant or food business. These are easy steps for you to take to increase your visibility, engagements and attract new customers to your food place. Connect with us for more information on how we can help you market your food business to your customers.